There are a few things I really love. Direct Sales, fashion, and crime shows top the list. So imagine my delight to see all three in the same place at the same time! 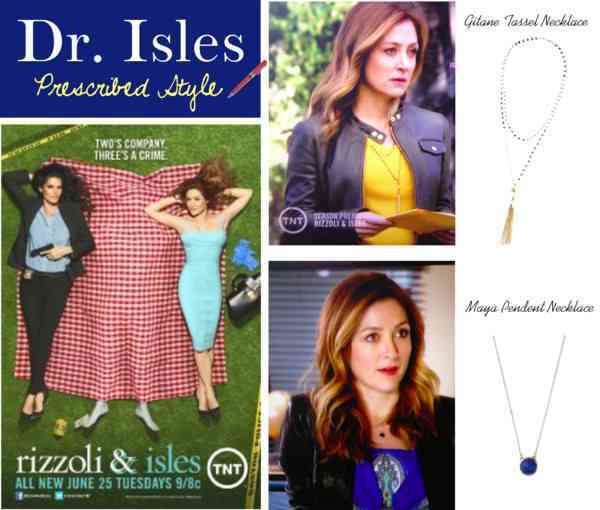 Last month as I was watching one of my favorite crime shows – Rizzoli & Isles – I noticed “Dr Isles” wearing a beautiful long tassel necklace. Now if you know anything about this show, Dr Isles is a chief medical examiner – and a total fashionista, often showing up to crime scenes in a new pair of Jimmy Choos. In this seasons premier episode I noticed her necklace, and raced straight in to my office…. where I found the exact same necklace sent to me for Christmas in July from Tracy Baschke, Independent Stylist for Stella & Dot. Stella & Dot is known for being worn by top celebrities, and there is a long list of actresses, models, and musicians who have been seen sporting a Stella & Dot piece. Our boutique-style jewelry and accessories line is available exclusively through in-home Trunk Shows by Independent Stylists and online. Our one of a kind collections are designed by celebrated New York designers and featured in Gossip Girl, In Style andLucky Magazine as well as on the wrists and necklines of today’s hottest celebrities. The Today Show, Wall Street Journal and The New York Times have praised Stella & Dot for our innovative social shopping concept which brings together the best of ecommerce, social media, personal service and passionate earning to create the ultimate home based business for today’s modern woman. Independent Stella & Dot Stylist Tracy Baschke sent me the perfect piece for my wardrobe. The Gitane Tassel Necklace has a layered look with one shorter necklace and a longer necklace adorned with a tassel – all in one piece. And it has a TON of sparkle. I loved it so much in fact that I wore it to my commercial shoot for Mutual of Omaha. When I later saw “Dr Isles” wearing it on tv – I felt like a total celebrity! I can tell this is a piece I will be wearing often! Stella & Dot also carries a line of handbags and fashion accessories, as well as tech accessories like iPhone and iPad cases – all with the Celebrity Chic that Stella & Dot is known for. You can check out everything Stella & Dot has to offer – including awesome products and an incredible business opportunity – on Tracy’s website, and enter to win your own Gitane Tassel Necklace below!